I don’t want to talk about this. I want to tell you about the color of the water at Kep, the hammock that swayed by the waves which slid on a day that lingered on mango fingertips, or the stone nobility of ancient ruins in banyan shade. But between Cambodia’s ancient history and its modern reality lies something else, this other thing, a part of their history too gruesome to be contained by a nation, so must be remembered and owned by all of us. We were somber when we left the Killing Fields at Choeung Ek, mourning the deaths of so many that estimates can’t even agree which million to begin with. Was it a quarter of Cambodia’s 8 million people who died, or nearly half? 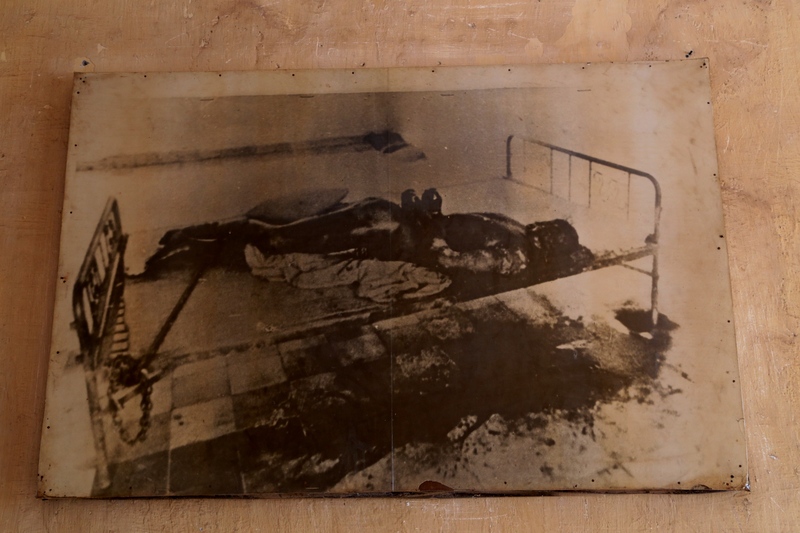 But the Khmer Rouge’s most notorious prison, Tuol Sleng, S-21, has something worse than sadness. It used to be a school. That’s the first part that gets me. Children ran and played in these halls, laughing and learning. But the Khmer Rouge opposed education, feared intelligence, so schools were closed, and this place became the site of a blasphemy against humanity. At first it just looked like a school. Then merely a prison. Bare rusty iron bedframes stood in the still air, and an awareness of abuse rose in my mind. Then I looked at the picture on the wall, and slowly accepted that the melted wreckage on the bed had been a human. I looked down at the floor and understood what the stains meant, the blood and ruined flesh in this room where people were left to decay between tortures, until they were finally allowed to die, perhaps murdered by hand at Choeung Ek, or thrown alive on a pile of burning tires. The images of pain, the relics of inhumanity, pile up in my memory of that place. Room after room of them, two buildings of three storeys each, more torture in the courtyard where children once played. 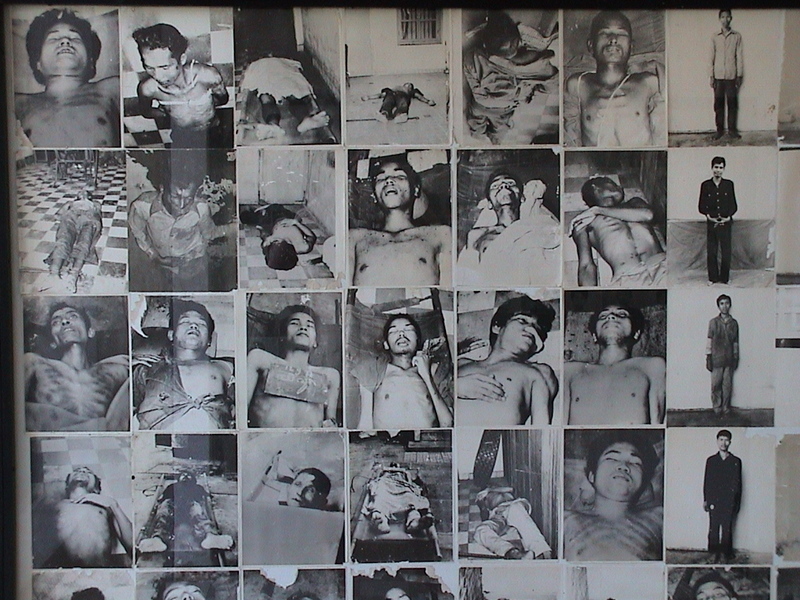 Photos of unknown victims now line the walls, so much data of suffering and such an absence of reason. Who did they think they were fighting? I understand the concepts. The Khmer Rouge told people in the countryside that all their woes were the fault of the city people, then gave them the guns to do something about it. And once it starts, it burns out of control, because what guard will protest the cruelty, when that might put him in shackles next? That happened regularly, in the Khmer Rouge’s internal purges. But at the end of the day, I just cannot make sense of the inhumanity of what happened. The sheer senseless cruelty is stupefying. It makes me wish I believed in demons, since demonic possession would explain it, might take it out of our hands. But it was not demons who did those things, it was men. So tempting to say “Well, we would never do that.” How many times can we say that? How many nations have to descend into madness before we realize it’s in us? And how many times will we stand around afterwards and wonder why no one did anything? I’m sure my grandfather meant it when he swore “never again” after World War II, yet we did nothing while the Cambodian people died. And we turned away while machetes cleaved flesh in Rwanda. And we pretended to believe Reagan while “freedom fighters” burned down houses with the families still inside in Nicaragua, just as they had in Guatemala. And maybe we tweet while Boko Haram turns children into suicide bombers. And maybe we click a petition while the bombs rain down on the long-tortured population of Gaza. On a normal day, I believe in humanity. I believe that our species is making gradual progress towards reason, gradually developing the abstract thinking to care about others, even if we don’t know them personally. 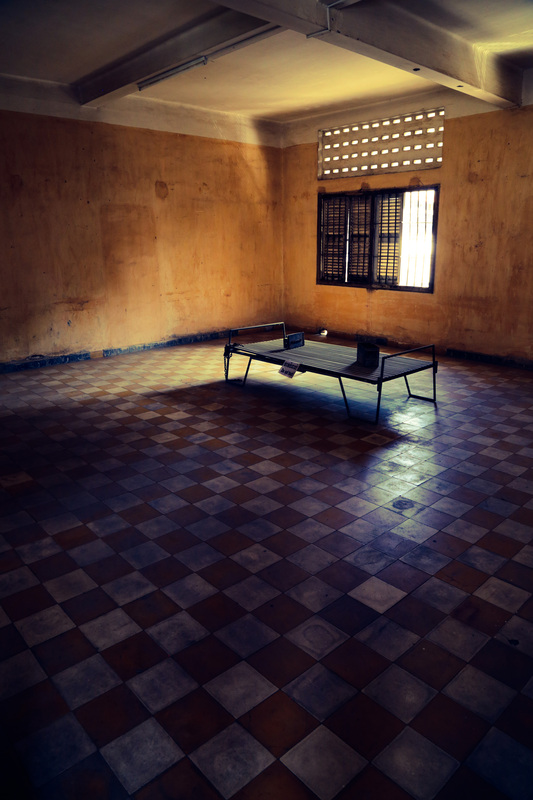 Gradually defeating the sort of reptile mind that thinks “Well, that’s just Them.” But that sort of sunlight is hard to see in a place like Tuol Sleng prison. And in that darkness, the headlines are still legible, as “hard liners” and sociopaths allowed to “lead” tear apart human bodies and minds. The sun was shining on the last day of 2014 in Phnom Penh. I still loved the city, but its sounds seemed muted. I still loved the country, but it felt sticky with drying blood. I still loved the planet, but it felt brittle with the violence we’re still allowing. The next day, we would travel to Chi Phat, where human goodness would again be on display, again tangible, again something I could believe in. But at the end of 2014, standing in the sun in a place where such inhumanity happened, I could not feel warm. ← Chi Phat, Cambodia. It ain’t New York or Miami. I don’t know what to think. I see violence everywhere, in every species, and I tend to view the human race as “just another species” … so I do think that violence is inherent within us. But I don’t know. I think sometimes people do terrible things because (within the context of their religion or other belief system), they truly think it’s the right thing to do. I think sometimes people do terrible things because they truly believe it’s what they need to do to survive. But then I see so much seemingly senseless and selfish violence in the world, and once again I don’t know what to think. Thanks for the post, and for talking about what none of us want to talk about. Thank YOU, for both reading and commenting! I think I know what you mean, with the suspicion that violence is just sort of…natural. We’d love our species to be “better” than that, but the fact remains that humans are animals, and our brains increase our capacity for violence beyond mere survival needs. 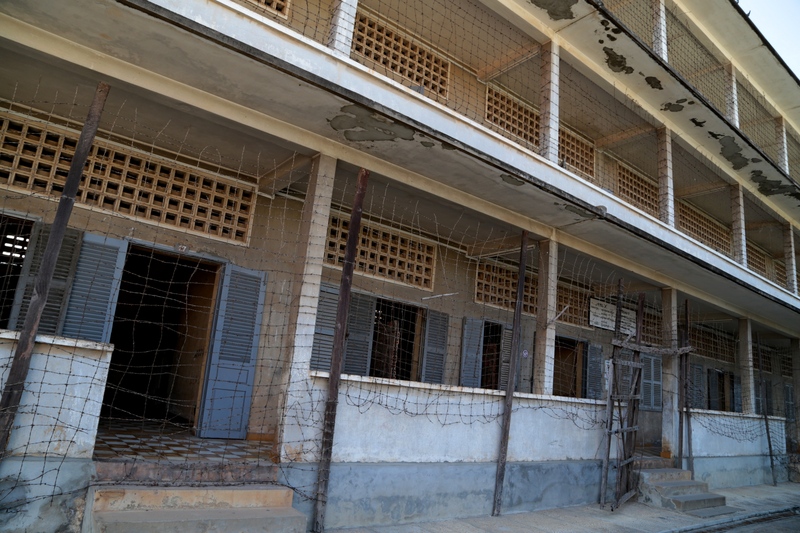 I think for me, the difference I felt in Tuol Sleng that was so disturbing was the utter uselessness of the cruelty. This wasn’t boys wanting to be rough to figure out a social order, or people competing for resources in an “uncivilized” way, or even a holy war of homicide, this was an organized system of pointless and excessive brutality. They didn’t just kill people, they tortured them. And the people they tortured were not then reintegrated into society, or used in any way, they were just tortured for long periods, then killed. My mind cannot grasp this, and my heart is afraid to try. Let me know if you come up with any answers! Yes, that’s exactly what I was trying to say, and I don’t believe I’ll ever have a satisfying answer. If I happen upon one, I’ll be sure to pass it along asap. And thank YOU for the podcasts, Radiolab and TED are my favorites! They were both really interesting, especially the segment about the baboons. I wouldn’t say it gave me “hope” for our species, but it definitely made me wonder about the fixedness of human nature. Intriguing stuff. Was the baboon one where they talked about how people on the street used to believe war would eventually end, but now people think it’s human nature? Every time I hear someone say “There will always be war” I cringe, now. We’ve been there. It made about as much sense to me as it seems to have done to you. Sometimes I look back on human history and think, well, give or take the odd modern genocide, maybe we’re getting better after all. Then I realise what a sad statement against our species that is. I know how you feel. I’ve heard, and believe (logically) that today is actually the most peaceful time humans have ever known….but that’s hard to accept, intuitively, in the face of so much atrocity. In the end, as you well know, it’s a darn big planet, so if we can count the atrocities on, say, one hand….it’s…well, no, I can’t bring myself to say it’s a “good” thing, but it sure could be worse. It could always be worse. Not sure if that’s a cheering thought or a depressing one. Guess you can see it either way. Well, you lobbed a thought-provoking grenade into my morning breakfast. Lately I’ve been noticing just how much, as a species, we like to band together in groups. We seem to need to seek out situations that create an “us vs. them” mentality. Sports likely are a healthy outlet for our group (and leader worship) tendency, but you see this kind of group-think everywhere, from nasty workplace cliques, to worshipful blog followers, to religion, to talk radio. If you set up an enemy or something to fear, it’s amazing what people will do to stay on the “us” side of power and there will always be ruthless individuals with their own twisted agendas. Education and a vigilant press can go a long way toward helping people think independently, but humans are frighteningly easy to manipulate. I think you’re on to one of the most significant challenges facing humanity today, in a modern world where it’s so easy to only talk to people who agree with you. All these studies (http://thedailyshow.cc.com/guests/4da60152-9bd7-45f7-ba05-d53f676be5ce) and personal experience show that when we only talk to people we agree with, we push ourselves further to extremes, whereas any traveler knows that contact with the “other” decreases the distance between you. People think they understand “Them” until they actually meet each other. PS. Sorry about blowing up breakfast, but if it’s any consolation, you blasted my dessert. It certainly is. I’m glad to see that it factors in the experiences of so many visitors to Cambodia, and in the remembrances of so many Cambodians. I can’t imagine standing in a place where so much violence has occurred. How courageous of you both to go there and then for trying to put it into context. Tim, This is a very powerful post! I have read many travel blog posts, but this by far one of the best. You are an excellent writer. I have a travel blog myself and wish I could write as well as you. I guess what struck me is that I felt the exact same way after visiting the killing fields at Cheoung Ek. I was emotionally devastated but managed to find solace at Wat Phnom. I share my experience here: http://www.ateachertraveling.com/wat-phnom-a-special-place/ but this post can’t hold a candle to yours. Thank you, Wes. I’m very glad to hear that you liked my post. The killing fields, all of Cambodia for that matter, are quite a place. I’m glad we have this outlet to share our experiences and thoughts about it. I just got back from a trip that included Dachau. While it is definitely a powerful place, somehow the…cleanliness of it?, kept it from being quite as visceral as the Cambodia sites. I’m glad you were able to find solace at Wat Phnom. I’ll remember that, if I go back. And thanks for your blog link, I look forward to checking it out.